Ofo the bike sharing startup based in China has set a goal of global expansion saying Thursday that it had raised more than $700 million in its latest funding round including monies from the Alibaba Group. Ofo’s funding round had several big names including Alibaba, CITIC Private Equity, Hony Capital, with more participation from two existing investors DST Global and Didi Chuxing. 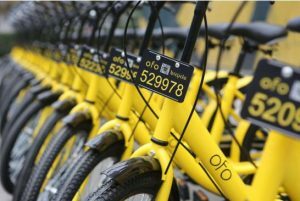 CEO and founder of Ofo Dai Wei said the company would be upgrading its services to ensure better experiences for the user, accelerate its strategy for global expansion and continue to maintain its edge as the leader of the bike-sharing industry. Wei added that the company’s vision is unlocking every corner of the world so Ofo will one day be a universal language. The company did not disclose its valuation for the most recent round of funding, but its CEO last April said the company was valued at over $2 billion. The bike-sharing industry in China has been getting more competitive, with upstarts like Ofo, its biggest rival Beijing MoBike Technology amongst others looking to improve the country’s urban mobility and promote green transportation. The bike-sharing concept is a simple one: People through an app on their smartphone unlock a bike near them and ride it to their destination for a fee. This enables them to avoid traffic jams in many cities across China. Investors say they have seen the market’s potential for some time and have invested large amount of money into the industry. Prior to the funding news on Thursday, Ofo said it was able to raise over $650 million. In June, MoBike announced that it raised more than $600 million during a funding round that was led by Tencent Holdings, the internet giants. Other companies that invested in MoBike’s recent funding round were Sequoia, Hillhouse Capital and TPG amongst others. Before the end of 2017, startup Ofo said it was planning to have more than 20 million bikes in its bike sharing ecosystem. The company added that it was planning to expand the reach of its services to more than 20 countries and 200 cities across the globe. The company also said that it currently had more than 6.5 million bikes located in 150 cities. With carmakers moving towards electric powered vehicles, the bike sharing industry has found a niche to promote greener transportation as well.